The golf tournament season is fast approaching and you need to plan ahead to maximize your return on sponsorship investment. If you are providing any form of giveaway, sponsoring a hole or offering a hole in one sponsorship you need to ensure your personal branding is included and you receive an adequate return on your sponsorship investment. 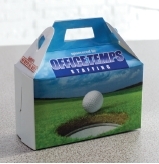 Here are a few cool, branded packaging ideas for golf tournaments. All you have to do is pick your product, provide us your logo etc and we will create the design for you. We have many more ideas so call us at 800-568-8338 for more information. 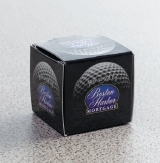 Holds two balls, some tees, a divot tool and ball markers. * A one-time set-up fee of $50.00 or $80.00 will apply. Design fee extra. Great post. Those are visually impactful ideas and not a lot of money per piece. Thanks for the ideas.